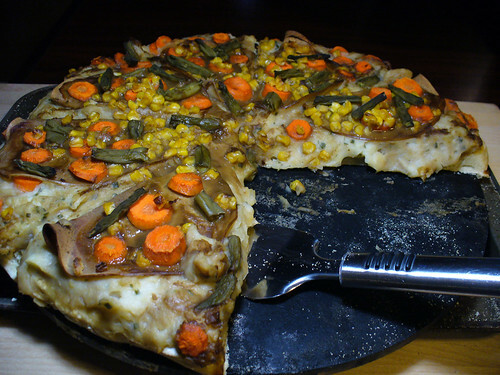 Recipe: Vegan Thanksgiving Pizza with all the fixings! Thanksgiving pizza, get in my belly! In preparation for the holiday, Shane and I did a test run last week. 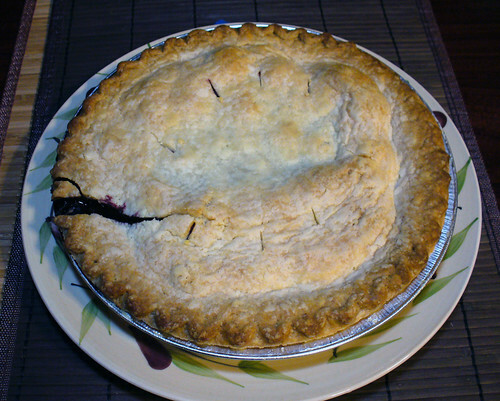 While the finished product was yum-tastic, our execution proved less than stellar. 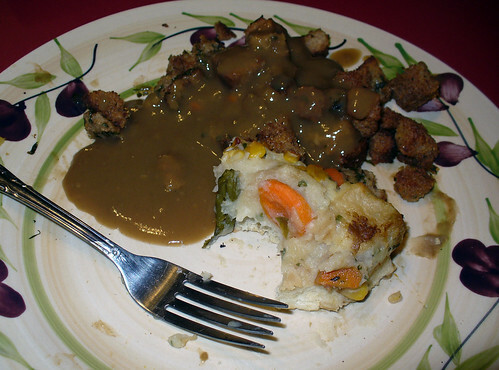 I thought I could use the gravy as a sauce – putting it down first the way you do with red sauce – and layer the tofurky slices, mashed potatoes, mixed veggies, and extra gravy on top. Alas, the gravy interacted with the dough in the most heinous of ways, softening it up and causing it to lose its structure and integrity. Meanwhile, spreading the mashed potatoes on top of the Tofurky was an exercise in futility (the gravy made ’em slip and slide! 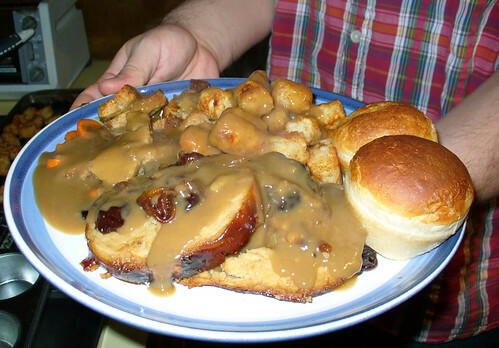 ), and as an added bonus, the weight of the potatoes forced the gravy out and down the sides of the pizza. (Gravy everywhere!) By the time we got to the top layer, we were in such a hurry that we only added carrots instead of our planned trio of veggies. ’twas hot, delicious mess all around. We wanted to incorporate stuffing into the pizza, but couldn’t think of a way to cook it on the pie, since the breadcrumbs need to bake in vegetable broth and all. 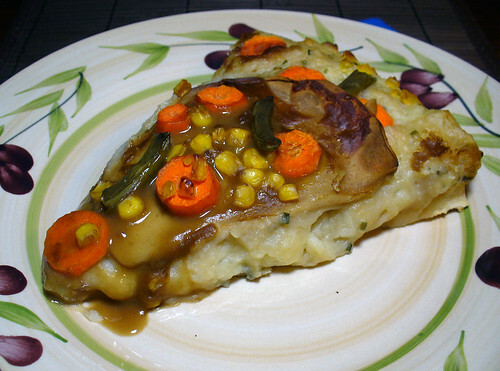 So instead we gave the crust a hint of stuffing flavor by infusing it with veggie broth. 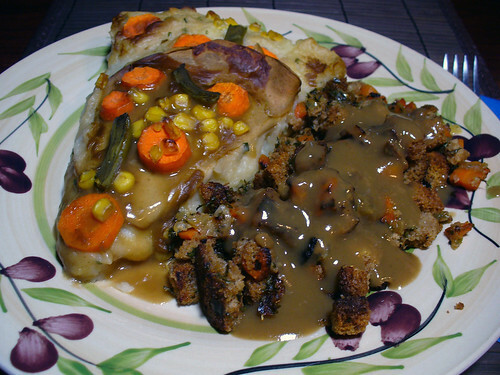 And, for good measure: we served stuffing on the side, along with cranberry sauce, extra gravy, and mashed potatoes and mixed veggies (both leftover toppings from the pizza). 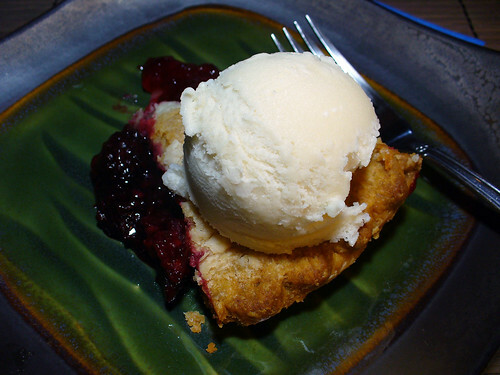 Dessert featured a razzleberry pie topped with a scoop (or two!) 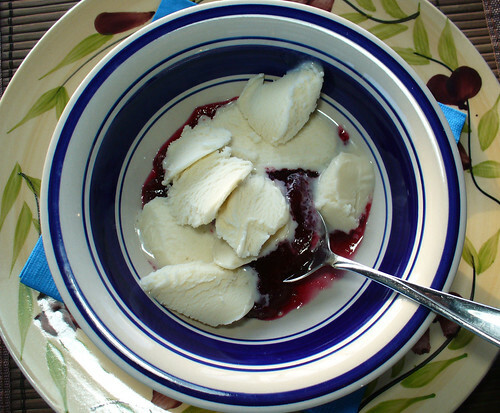 of vanilla soy ice cream. Both store-bought, because we were exhausted enough after making the main course! More eye candy – and recipes for most everything pictured! – below. Two slices down, six to go! 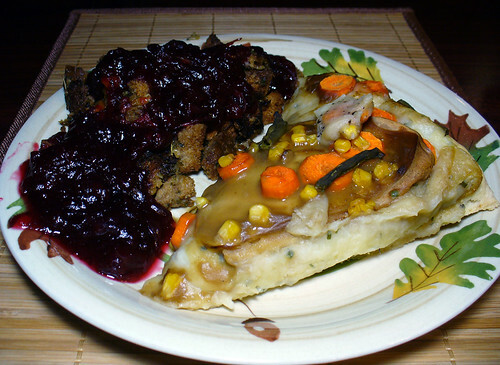 Shane’s plate; he slathered his stuffing in cranberry sauce. 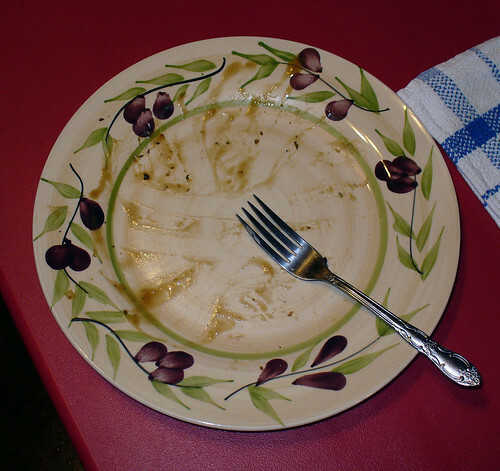 My plate! “Gravy” is the word of the day, dontchknow. a) covered in mashed potatoes or b) a deep dish pie of some kind. Pizza & ice cream, could a more perfect pairing exist? Posted: 11/26/11 at 1:36 pm. Filed under: Food & Recipes.